Whitestar - the half Vorlon/half Minbari ship that has come to symbolize the Army of Light. Fast, maneuverable and heavily armed for her size, and the only ship this small able to open a jump point on its own. First seen in the Season 3 opener 'Matters of Honor'. Two kits were available, both resin and expensive. John David Cook looks over Gizmotron's 1/2500 Whitestar kit. Steve Sloan's review of Spacemam's kit. Vince Hoffman's preview of the IFactory Advanced Technology Cruiser kit. William Blackmore's details the Anubis kit. 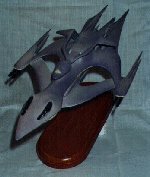 Minbari Nial Fighter - The main Minbari fighter since at least the Earth-Minbari War. Somewhat larger than the Starfury, but faster, more agile, and more heavily armed - and built from/equipped with advanced technology rendering it practically invisible to most sensors. Only one kit is available at the time of writing. Kevin Kovarcik's preview of Controlled Energy Design's kit. Shadow Vessel - the most sinister, evil-looking of sci-fi space craft. A living machine, it requires a sentient being to merge with it and become the 'brain' of the ship. Only one kit, by WARP, was available until Howling Wolf Productions came to the rescue. Image courstesy of A.M. Retondo. There are so many cool ships in the B5 universe - and so few have actually been cast/sculpted/molded (at least 'legally'). What's a modeler to do? Steve Gay is building a scratchbuilt Omega-class destroyer. Gaming miniatures and toys that have been licensed can be used as references - in addition to freeze-framing through hours of B5 episodes! A series of 18 Micro-Machines (TM) depicting ships seen in the first two seasons was released - but they're hard to find now. Also licensed are the Agents of Gaming pewter miniatures. They have completed work on Earth, Narn, Centauri, and Minbari fighters and are working on sculpting and casting more capital ships. The detail is pretty good from things this small, and tthey aren't as hard to assemble as some have made out - for more in-depth reviews, see our B5 Mini's section. This page copyright © 1997-2005 Starship Modeler. Last updated on 5 January 2005.